This morning, while I chatted with my 3-1/2 year old son over coffee, my husband shared a story he was reading on the Fairbanks Daily News-Miner’s website. The AP story, “Rare century-old $5 Alaska bill to be auctioned” by Rachel D’Oro, described an upcoming auction sale of an extraordinarily rare piece of Alaskan paper currency. My husband knew about a similar piece that we had accessioned back in 2009, which I have shared with the Tanana Yukon Historical Society as well as the Fairbanks Coin Club in past presentations. At each presentation (the TYHS presentation only included a photo while the FCC folks got to see the real thing in person) viewers were in awe of the perfect specimen in our collection. 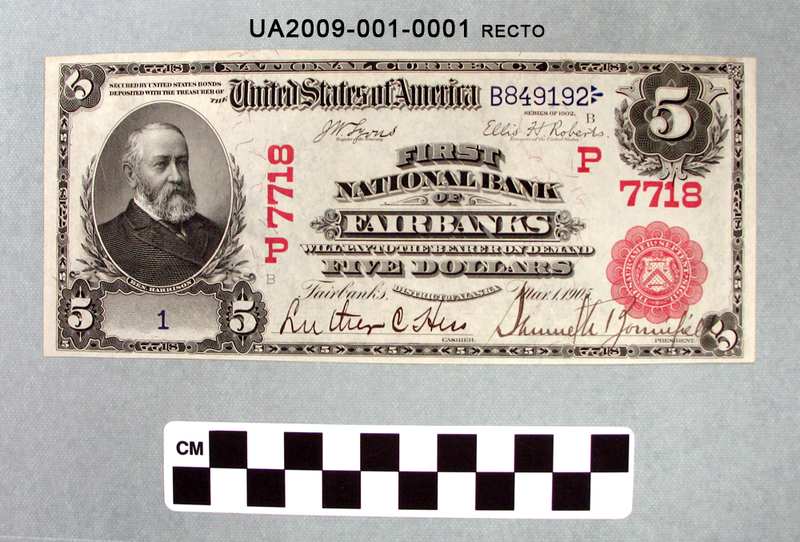 The history of our $5 bank note is mostly blank: we received it from former UAF Rasmuson Library Alaska and Polar Regions archivist, Anne Foster, as a “found in collection” piece. We have a standing MOA with the library that states that all photographic, manuscript, and other similar items (i.e., items that contain information) are to be curated at the archives while all 3D and object-type things (i.e., more ephemeral or decorative items) come to the Museum to be curated. As a result of this agreement, the archives staff and I are old friends and are always calling each other up with statements like, “Hey, I found this thing in the collection and I think it needs to come to you. When will you be near the library/museum next?” So when a unique $5 bank note showed up in a box of items from Anne, I was not surprised to learn that they had no information associated with it and we started our own internal research to accompany our Preliminary Justification Form to the Museum’s acquisitions committee. Having just come back from maternity leave, I had my student, Micole VanWalbeek do that web-based research. What she found included an auction sale of the same (P)7718 stamp and red seal, but a serial number and different signatures. The number in the upper right corner was also different. That particular $5 note sold for $27,600 in 2006. I promptly put our bill into our vault. The story in today’s paper describes a bill seemingly identical to ours. Upon closer comparison, the only difference seems to be a small “B” on our bill, as compared to the “C” on the bill up for auction, the plate designation. The auction house representative quoted in the article describes there being only four of these bills printed. So this is sometimes how the documentation about items in museum history collections is collected. My file on this piece now has twice the number of citations as before. The catalog entry in my database will be much more rich, and our insurance assessment will be much more accurate. Guess I’ll keep my eyes on this story, and others, that are connected to this early form of paper currency in Fairbanks.